eDepartment of Neurosurgery (F-.J.H. ), Paracelsus Kliniken, Osnabrück, Germany. BACKGROUND AND PURPOSE: Spinal dural arteriovenous fistulas located in the deep lumbosacral region are rare and the most difficult to diagnose among spinal dural arteriovenous fistulas located elsewhere in the spinal dura. Specific clinical and radiologic features of these fistulas are still inadequately reported and are the subject of this study. MATERIALS AND METHODS: We retrospectively evaluated all data of patients with spinal dural arteriovenous fistulas treated and/or diagnosed in our institution between 1990 and 2017. Twenty patients with deep lumbosacral spinal dural arteriovenous fistulas were included in this study. RESULTS: The most common neurologic findings at the time of admission were paraparesis (85%), sphincter dysfunction (70%), and sensory disturbances (20%). Medullary T2 hyperintensity and contrast enhancement were present in most cases. The filum vein and/or lumbar veins were dilated in 19/20 (95%) patients. Time-resolved contrast-enhanced dynamic MRA indicated a spinal dural arteriovenous fistula at or below the L5 vertebral level in 7/8 (88%) patients who received time-resolved contrast-enhanced dynamic MRA before DSA. A bilateral arterial supply of the fistula was detected via DSA in 5 (25%) patients. CONCLUSIONS: Clinical symptoms caused by deep lumbosacral spinal dural arteriovenous fistulas are comparable with those of spinal dural arteriovenous fistulas at other locations. Medullary congestion in association with an enlargement of the filum vein or other lumbar radicular veins is a characteristic finding in these patients. Spinal time-resolved contrast-enhanced dynamic MRA facilitates the detection of the drainage vein and helps to localize deep lumbosacral-located fistulas with a high sensitivity before DSA. Definite detection of these fistulas remains challenging and requires sufficient visualization of the fistula-supplying arteries and draining veins by conventional spinal angiography. A recent meta-analysis of all case series that included >5 patients concluded that men were affected 5 times more often than women and that the mean age at the time of diagnosis was 55–60 years.6 If not treated properly, SDAVFs are associated with a considerable morbidity with progressive spinal cord symptoms.1,7,8 The clinical presentation of an SDAVF can be ascribed to venous congestion due to pathologic arteriovenous (AV) shunts in most cases.9 Initial symptoms are often nonspecific.3 They include gait difficulties, symmetric or asymmetric sensory symptoms such as paraesthesia in 1 or both feet, diffuse or patchy sensory loss, and radicular pain.6 More than 80% of all SDAVFs are located between T6 and L2, but SDAVFs can occur anywhere along the dura of the spinal canal.7 According to various reports, fistulas in the sacral region occur in approximately 4% of patients with SDAVFs.6,10 However, larger series dealing with SDAVFs located in the deep lumbosacral region (lsSDVAF) are still lacking in the literature. The purpose of our study was to evaluate the clinical and radiologic data of 20 patients with lsSDAVFs presenting to our center between 1990 and 2017. After obtaining permission from our local ethics board, we retrospectively evaluated the medical and radiologic reports of the RWTH Aachen University Hospital for patients diagnosed with SDAVF between January 1990 and March 2017. SDAVFs located above the L5 vertebral level and arteriovenous malformations of the filum terminale were excluded from our analysis. Two experienced physicians analyzed the radiologic data blinded to all clinical data. A reference standard for statistical analysis was established in a consensus reading. The extension of the T2 signal hyperintensity and the medullary contrast enhancement were qualified by the number of vertebral levels shown to be affected on T1 and T2 MR images. The appearance of the perimedullary veins was rated subjectively as absent, mild, or prominent due to their tortuous and dilated appearance on the T1 and T2 images. The neurologic status was assessed according to the Aminoff-Logue disability score (AL-score). We re-evaluated the documented neurologic status at the time of admission (AL-score), the duration of symptoms from onset until diagnosis, as well as previous misdiagnosis and treatment. Before admission to our center, all 20 patients underwent extensive spinal DSA and/or MR imaging (0.5T and/or 1.5T). Two experienced physicians analyzed the radiologic data blinded to all clinical data. A reference standard for statistical analysis was established in a consensus reading. The extension of the T2 signal hyperintensity and the medullary contrast enhancement was qualified by the number of vertebral levels shown to be affected on T1 and T2 MR images. The appearance of the perimedullary veins was rated subjectively as absent, mild, or prominent due to their tortuous and dilated appearance in the T1 and T2 images. After re-evaluation of all previous spinal angiographic examinations performed elsewhere before admission to our center, we finally focused our further DSA examinations on the lumbosacral region. DSA was performed with a femoral approach in a dedicated biplanar neuroangiographic suite. Standardized angiography included selective manual injections of 4–5 mL of 300 mg/mL of iodinated nonionic contrast medium into the lumbar and intercostal arteries. Furthermore, injections into both vertebral arteries, the costocervical arteries, the thyrocervical trunks, and the arterial feeders of the sacral region were added. Imaging was in the anteroposterior direction with 2 frames per second. Oblique and lateral views were added to elucidate the morphology of the AV shunt as well as the intradural course of the draining veins. Film sequences of at least 5–20 seconds were obtained. In 2 patients, in whom lsSDAVF was previously diagnosed elsewhere before referral to our center, our DSA examinations included solely the deep lumbosacral region. Pearson χ2 tests and Fisher exact tests were used when applicable. Student t tests and Mann-Whitney U tests were used when applicable after testing for data distribution with a Shapiro-Wilk test. P values with an α level of ≤.05 were significant. All statistical analyses were performed with SPSS 23 software (IBM, Armonk, New York). We identified 194 patients with SDAVFs located anywhere along the spine. Twenty (10.3%) of these patients had lsSDAVFs and were included in our study. Table 1 provides an overview of clinical findings in all 20 patients included in this study. Seventeen of 20 (85%) patients were men. The mean age was 63 ± 5 years (median, 63.5 years; range, 53–78 years). Overall, 16 (80%) patients experienced a gradual onset and progressive deterioration of neurologic function. The remaining 4 (20%) patients had a rapid deterioration of their motor function in the lower extremities within a mean period of 2.5 months (range, 1–4 months) and presented with a severe motor disability at time of admission. However, the most common neurologic finding at time of admission at our institution was subjective and objective gait disturbances of the lower extremities. Paresis in the lower extremities was present in 17 (85%) patients. The remaining 3 patients (15%) had a slowly progressive ataxia and hypesthesia without manifest motor deficits. Sensory symptoms in various severities were documented in 18 (90%) patients and comprised diffuse loss of sensation and/or paresthesia in the lower extremities. One (case 15) of these 18 patients had dysesthesia from the T12 level downward. Fourteen (70%) patients presented with a sphincter dysfunction at time of admission to our institution. The mean time between clinical onset and diagnosis in all 20 patients was 15 ± 12 months (median, 15 months; range, 1–36 months). The mean Aminoff-Logue disability score at time of admission was 3 ± 1.5 (median, 3; range, 1–5). Overall, 9 of 20 (45%) patients had undergone other treatments before admission to our institution. Six of these 9 patients underwent microsurgical lumbar dorsal decompression and/or discectomy due to the assumption of a spinal degenerative disease. Two other patients underwent a biopsy with the assumption of an intramedullary tumor. The remaining patient was admitted to our center due to recurrence of the lsSDAVF after repeat endovascular treatment performed elsewhere. Table 2 provides an overview of radiologic findings in all 20 patients. On preoperative MR imaging, there was a medullary T2-weighted hyperintense signal in all except 1 patient (95%) (mean, 7 vertebral levels; range, 0–13 vertebral levels). The signal alteration involved the conus medullaris in 16 (80%) patients. There was intramedullary contrast enhancement in 15 (75%) patients (mean, 3 vertebral levels; range, 1–10 vertebral levels). Another 16 (85%) patients presented with an enlargement of the perimedullary veins in the upper thoracic and/or thoracolumbar region in various extensions (mean, 4 vertebral levels; range, 0–7 vertebral levels). The filum terminale vein (FV) was dilated in 12 (60%) patients; in another 7 (35%) patients, other dilated lumbar veins were detected. In the remaining patient, no pathologic changes of the FV or the lumbar radicular veins were obvious in the presence of dilated perimedullary veins. All 20 patients underwent repeat spinal DSA until a definite diagnosis was established (mean, 3 DSAs; range, 2–5 DSAs). Overall, 8 (40%) patients received preoperative spinal CE-MRA, which revealed no evidence of an SDAVF in the upper thoracic or thoracolumbar region. However, in 7 of these 8 (88%) patients, CE-MRA demonstrated a prominent FV or lumbar radicular vein in the MIP, and MPR images suggested fistula localization in the deep lumbosacral region. In 4 (20%) patients, the dilated perimedullary veins in the thoracolumbar region were microsurgically exposed and the direction of flow was assessed via Doppler sonography. The subsequent DSA was focused on the lumbosacral region, and a lsSDAVF could be identified in all 4 patients. DSA revealed, in 17 (85%) patients, an arterial supply via the arches of the internal iliac arteries, namely the iliolumbar (n = 11) and the lateral sacral arteries (n = 6). The remaining 3 patients presented with an arterial supply via the middle sacral artery and the L4 and L5 segmental arteries, respectively. In 5 (25%) of these 20 patients, DSA demonstrated a bilateral arterial supply via both the iliolumbar arteries (n = 4) and lateral sacral arteries (n = 1). There were no major complications related to angiography. Because most studies that deal with lsSDAVFs are case reports and smaller case series, more comprehensive studies are lacking.12 Thus, it was our aim to describe the clinical and radiologic features of lsSDAVFs in a series of 20 consecutive patients who presented to our institution. In the literature, the sacral region was considered a rare location for SDAVFs (4%).10,13 However, the incidence of lsSDAVF in our recent series accounts for up to 10.3% of patients with SDAVF. This higher rate of lsSDAVFs in our series is explained by the large number of patients with suspected SDAVFs who were referred to our institution as a tertiary referral center for spinal vascular diseases. Moreover, our current study also included SDAVFs localized at the L5 vertebral level (n = 4). Nonetheless, to the best of our knowledge, our study represents, at the time of this writing, the largest single-center series dealing with clinical and radiologic features of lsSDAVF. Moreover, the relatively high rate of misdiagnosis in patients with lsSDAVFs (40%) demonstrates the difficulties in detecting the suspected fistula and the broad spectrum of probable differential diagnoses. These difficulties, in turn, may lead to clinically relevant delays until the correct diagnosis is established. It has been hypothesized that clinical symptoms become more severe the longer the correct diagnosis and treatment are delayed and the venous congestion persists.4,10,19 We could not identify a significant correlation between symptom duration and the severity of morbidity for all 20 patients (P = .41). Nevertheless, intraindividual progressive deterioration of symptoms was present in all our patients. Nevertheless, the enlargement of the perimedullary veins was absent and mild in 14 (70%) patients and prominent in only 4 (20%) patients. Additionally, dilated FV or radicular veins in the deep lumbosacral region were the hallmark of lsSDAVFs in our MR images and were present in 95% of patients. In all 7 of 8 (88%) patients who underwent CE-MRA, the arterialized FV and lumbar veins appeared even more prominent than the enlarged perimedullary veins in the respective cases. Moreover, the multiplanar reconstruction of CE-MRA images in our series allowed a sufficient differentiation between FV and other lumbar veins. At least 3-mm sagittal sections in T1/T2 MR images are necessary to identify these veins. The prominent appearance of the FV in patients with lsSDAVF has been previously discussed in a few reposts.20,23 However, our recent findings demonstrate that the deep lumbosacral course of either a prominent arterialized FV or other lumbar radicular veins combined with typical medullary congestion should always evoke the differential diagnosis of an AV shunt in this region, even in the absence of prominent perimedullary veins (Figure). A and B, Sagittal T2- and contrast-enhanced T1-weighted images reveal congestive myelopathy and dilated perimedullary veins (white arrows). C and D, Spinal CE-MRA shows dilated radicular veins in the lumbar region suspicious for an SDAVF in the lumbosacral region (white arrows). E–H, DSA examinations identify the fistula in the dural sleeve of the left S2 root (black arrowhead) supplied via the lateral sacral artery (white arrowhead). Note the upward draining sacral radicular vein (black arrow). I and J, Intraoperative indocyanine green angiography confirms the intradural course of the arterialized draining vein (black arrow) embedded at the ventral side of the S2 nerve root. One of the milestones in the diagnostic evaluation of spinal vascular malformations was the development of time-resolved contrast-enhanced MR angiography.1,11 In a series reported by Mull et al,1 the MRA-derived level of the feeding artery in SDAVFs agreed with DSA findings in 14 of 19 cases, including 2 patients with lsSDAVF at the S1–2 level. In the remaining 5 cases, a mismatch of only 1 vertebral level (not side) was noted for the feeding artery. In fact, the need for microsurgical exploration to identify the blood flow in the arterialized veins in the thoracolumbar region decreased in our series after establishment of the CE-MRA technique in our center. Due to our recent experience, we found that more advanced 4D-MRA techniques with better time resolution may provide additional information about the flow direction in the intradural arterialized veins. However, despite technologic advances, DSA of the pelvic region remains technically challenging. A trivial-but-common problem that resulted in an impaired DSA image quality was bowel dysfunction, present in most patients in our series. We could overcome these difficulties by the prophylactic administration of spasmolytic medication 1 day before or during the DSA. Moreover, due to the low-flow character of these fistulas and the long drainage up to the conus medullaris, lsSDAVFs could be easily missed by inexperienced readers during DSA. Thus, prolonged DSA series with additional oblique and lateral projections are recommended in these patients. The fistula locations in our series ranged from L5 to S3 level. Sixteen of 20 (85%) demonstrated an arterial supply via arches of the internal iliac arteries. The arterial supply of the remaining 3 fistulas was unusual: Case 3 presented with an lsSDAVF localized at the S1 level, with an arterial supply via the middle sacral artery; cases 6 and 9 presented with a fistula localized at the L5 level with an arterial supply via an atypical L5 segmental artery arising from the abdominal aorta and a descending L4 segmental artery, respectively. Most interesting, fistulas localized at the L5 level (n = 4) presented with a broad variety of arterial feeders comprising the iliolumbar arteries and L4 and L5 segmental arteries. Moreover, 5 (25%) of 20 patients in our series presented with a bilateral arterial supply via the arches of both internal iliac arteries (On-line Figure). The detection of a bilateral arterial supply of an lsSDAVF was significantly higher in patients who were diagnosed after establishment of CE-MRA in 2003 in our center (P < .05). This finding reflects growth in our own experience in diagnosing theses fistulas and the development of multimodal diagnostic tools. 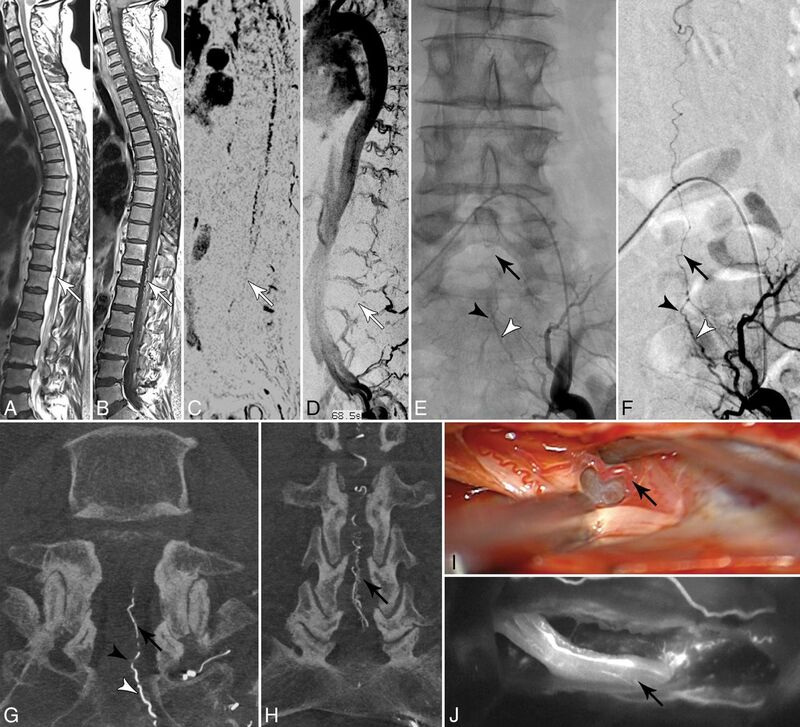 The complex angioarchitecture in the deep lumbosacral region with a variant and frequently bilateral arterial supply may contribute to difficulties in identifying the fistula. Thus, an optimal DSA examination for the sacral region requires selective and long visualization of all lumbar segmental arteries, the middle sacral artery, and both internal iliac arteries and their arches. If these examinations remain nonconclusive, super selective catheterization of potential feeding arteries in the pelvic and lumbar region may be indicated. Moreover, the bilateral arterial supply in these patients could be sufficiently visualized in series with superselective distal microcatheter injection, resulting in a better opacification of the feeding arteries. Nonetheless, once an AV shunt in the deep lumbosacral region is suspected, the most probable differential diagnosis for an SDAVF is an arteriovenous malformation of the filum terminale. In both cases, namely SDAVF and filum terminale–AVM, symptoms are caused by medullary venous congestion resulting in comparable myelopathic disorders and a progressive clinical course. In contrast to lsSDAVFs, the filum terminale artery arising from the anterior spinal artery predominantly feeds a filum terminale–AVM. Even though the filum terminale–AVM is an extremely rare disease, one should be aware of this differential diagnosis in every suspected AV shunt located in the deep lumbosacral region. In inconclusive repeat DSAs, the search for the exact fistula localization should not be discontinued in patients with a high probability of an SDAVF.25 In certain cases, a surgical exploration of the arterialized perimedullary veins might be helpful; to facilitate the detection of the fistula localization in subsequent DSA in 4 patients with repeat nonconclusive DSA examinations, we microsurgically exposed the arterialized perimedullary veins in the thoracolumbar region at the level with the greatest vein enlargement. We then assessed the direction of blood flow in these veins via intraoperative Doppler sonography. In all 4 cases, a caudocranial blood flow was detected. Thus, subsequent DSA examinations were focused on the thus assumed deep lumbosacral origin of the fistula. This strategy was successful in all 4 cases. In summary, we note that lsSDAVFs remain diagnostically challenging, even in experienced hands. Spinal CE-MRA provides, in most the cases, a sufficient visualization of the perimedullary and lumbar draining veins and facilitates the subsequent DSA examinations. However, for a precise fistula localization, DSA remains the criterion standard diagnostic tool. The low-flow characteristics of these fistulas with a frequently variant arterial supply and problems of optimal visualization may cause serious difficulties in localizing the fistula via DSA. Thus, optimized DSA examinations require a sufficient visualization of all potential feeding arteries and draining veins in the pelvic and lumbar regions. In practice, prolonged series as well as additional oblique and special lateral projections help visualize the intradural course of the draining vein up to the conus. Clinical symptoms caused by lsSDAVFs are often nonspecific and may mimic a variety of conditions. The presence of a dilated FV and/or lumbar radicular vein on MR imaging/CE-MRA combined with typical congestive medullary changes should always evoke the differential diagnosis of an arteriovenous shunt in the deep lumbosacral region, even in the absence of perimedullary dilated veins. However, identifying lsSDAVF via DSA remains challenging due to the complex and variant spinal arterial supply in this region and the difficulties in the optimal visualization of the lumbosacral region.
. Durchblutungsstörungen des Rückenmarks: neurologische Untersuchungen zur Pathogenese und Strategien der Diagnosesicherung. Department of Diagnostic and Interventional Neuroradiology, University Hospital Aachen. 2004. https://www.researchgate.net/publication/33987973_Durchblutungsstorungen_des_Ruckenmarks_neuroradiologische_Untersuchungen_zur_Pathogenese_und_Strategien_der_Diagnosesicherung. Accessed 2003.